On a late night with nothing to do but hang around cow pastures, the idea of cow-tipping may easily cross your mind. Assuming there is a cow asleep and standing up, you next want to figure out how much force is required – if applied perpendicularly – to tip the cow over. The Statics of Cow Tipping has provided approximate values and has performed calculations. Here, we will discuss the process undertaken as well as a critique of the work. 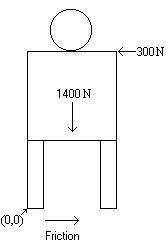 From here, we can find the center of mass for each body part. Shown below is the table from The Statics of Cow Tipping (source). In addition to leaving out units (which I have added in), the site fails to explain where exactly the body parts are located and to what point are the Center values relative. To the left is my own rendition of the cow, which is drawn more closely to scale and includes the point of relativity, noted as the origin point (0,0). To find the correct radius, we need to consider the moment arm of the force. Since the moment arm is the perpendicular distance from the axis of rotation to the extended line of force, we see that r(f) is indeed perpendicular to the pushing force and r(c) is indeed perpendicular to the force of gravity on the cow. We can easily find that r(f) = 5 ft and r(c) = 1.25 ft. Now the difference in torque is 1400*1.25-300*5=250 lbs/ft. We need the torque to be less than zero for the pushing force to be sufficient enough to overcome the cow's turning force, so it is clear that one person is not enough to tip a cow. We're determined to tip the cow, so let's add more people. Assuming the people have identical pushing height and force and will stand in a way so as to push the cow in a uniform manner, then we can calculate that the minimum number of people required to tip a cow is 1400*1.25 < n="2. Our results agree with The Statics of Cow Tipping. However, we must also consider some real life truths. Most likely, a real cow's legs will move or tilt when the cow is pushed. On the plus side, this moves the center of gravity, making it easier to tip the cow as the shift will shorten r(c) with time while r(f) remains the same. Unfortunately, the cow would sure counter-balance, making it more difficult to tip. Even so, these calculations are still good approximations and as such, leave the myth of cow tipping open to testing!